Capacity 30 lb x 0.005 lb, 12 x 12 in. Stainless Steel Platter, Wall Mounted Display. Capacity 60 lb x 0.01 lb, 12 x 12 in. Stainless Steel Platter, Column Mounted Display. 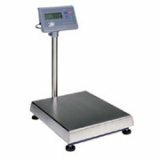 Buy Industrial Scales and Commercial Scales at Northern Tool. Also a great place to find Industrial and Commercial Supplies.